Many of the water-rich foods are high in fiber, but low in calories. Researchers have found that the body senses it is full by the volume of food and not the number of calories consumed. By filling up on water-rich foods first, you end up feeling full, eat less high-calorie foods and in the end eat fewer calories over the course of that meal. Fruits and vegetables, like spinach, broccoli, cucumber, tomato, carrots, watermelon, berries, apples. Low-fat or fat-free milk products, such as milk, Greek yogurt, cottage cheese. Non cream-based soups, including soups made from vegetables, chicken or beef broth or tomatoes. Spinach, broccoli, cucumbers, tomatoes, carrots, watermelon, berries and apples are just a few of the fruits and vegetables that are rich in water and nutrients. You can still have dairy products like milk, Greek yogurt and cottage cheese; just make sure they are either low-fat or fat-free. Also there are some great dairy alternatives, such as almond, soy and rice milks. All are low in fat and calories. 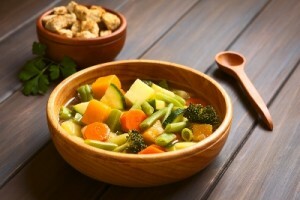 Stick with vegetable-based soups, soups made with chicken or beef broth or tomato-based soups all contain lots of water, but not many calories. Stay away from cream-based soups; a cup of mushroom bisque has 400 calories while the same amount of minestrone soup has only 112 calories. To eat fewer calories during your main course, start your meal with an appetizer made from one of the above foods. A bowl of broth-based soup or a green salad (without the cheese or croutons), make great appetizers that partially fill you up so you eat less of the high-calorie main entrée. How vegetables are prepared can either keep them healthy or add calories and fat that you don’t need. Instead of frying or cooking with creams or butter, try steaming and add in some spices for flavour. Steaming also preserves most of the nutrients that would be otherwise lost in many of the other preparation processes that use high heat. You might eat a nice low-calorie meal, but if you wash it down with a high-calorie drink, all is for naught. Instead of drinking high-calorie laden sports drinks, alcohol or fruit juices, drink plain water with lemon, sparkling water, or unsweetened ice tea. If you like to drink milk with your meal, make sure it is skim or one of the milk alternatives. Eating fewer calories doesn’t mean eating less food; it means eating foods rich in water and fiber, but low in calories. Once you get used to eating this way, you won’t want to go back to the high-calorie, high-fat heavy foods.